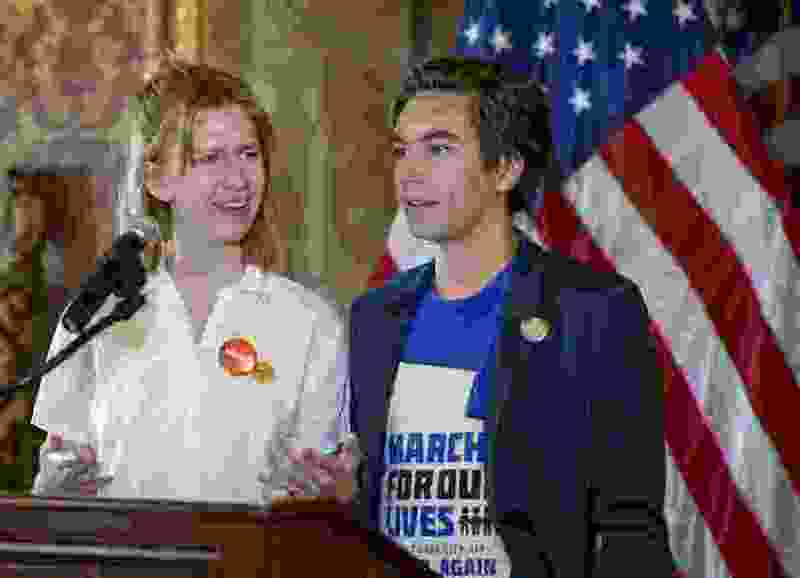 Leah Hogsten | The Salt Lake Tribune l-r "It's a great start," said Elizabeth Love, recent West High School graduate and Utah Safe School Commissioner along with Brighton High School graduate Isaac Reese. "I hope that a special session comes out of this." The Utah Safe Schools Commission unveiled several recommendations to improve campus safety, Wednesday, June 20, 2018 during a press conference at the Utah Capitol. One small step for gun sanity — maybe more than one — has come from an ad hoc group of Utah politicians and experts. Very broadly, what the Utah Safe Schools Commission has done is to give voice to the common-sense realization that it is no loss of Second Amendment rights for a state to realize that not every breathing human being has a right to any sort of firearm he may be able to lay his or her (usually his) hands on at any time. One specific recommendation in the panel’s report last week is a law that would allow anyone who is aware of another person posing a credible threat to the community to go to court and get an order to confiscate any firearms in that person’s possession. Utah already allows such protective orders in a cases when a threat has been made against a specific individual. This idea would extend that category to those who pose a threat to the community more broadly. Such a bill was put before the Legislature in its last session. It failed to pass in the crush of other business but still has support among some lawmakers. It is the kind of thing that seems necessary and proper in the wake of so many mass shootings, especially but not limited to those in schools. Not every person who has gone on a shooting spree has, in hindsight, left evidence of their precarious mental state. But many have, and removing even those few threats is something any society has a right and a duty to do. Other good ideas from the commission include development of school threat-assessment teams and pushing the state to do a better job of adding the names of those with known mental health issues to federal background check databases. Further down the group’s list — either because support was not unanimous or because the chances of having them passed into law seemed more remote — were such things as universal background checks and waiting periods for the purchase of firearms. Those are good ideas, too. One really bad idea was also on the list. It was to respond to the threat of too many guns in the hands of too many incompetent people by making it harder for anyone — including the students and teachers who belong there — to get into a school building. Some security improvements in any public building may well be worth doing. But to make a school into a kind of prison in reverse — a “hard target” — only makes sense if we have given up on the idea of putting even mild limits on firearm possession because we value gun rights more than the rights of people to come and go in peace. Ignore that suggestion, and the rest of the commission’s ideas make good sense.